We advise not to wash the vehicle for at least 48 hours after the installation has been completed. This is because the paint protection film will still be curing and therefore any agitation from washing may interfere with this process. Once this period has passed and you do decide to wash the vehicle we advise using pH neutral shampoos in conjunction with a lambs wool wash mitt. If using a pressure washer you will need to be mindful to stay around two feet away when using it, especially around the edges of the film. Although not essential the two-bucket method is highly recommended when washing. The film can also be waxed and sealed just like your paintwork. However we do advise against waxing over the edges of the film. We suggest leaving a 2cm gap when waxing up to an edge of the film. HOW LONG SHOULD I WAIT BEFORE HAVING PAINT PROTECTION FILM APPLIED IF MY CAR HAS BEEN RE-SPRAYED? We recommend that the re-sprayed paintwork be left for a minimum of four weeks to harden before any paint protection film is applied. If the film is applied within this four week period then there is a risk that the paint could lift if the film is removed at any point. CAN I USE A PRESSURE WASHER FOR WASHING, AND IF SO HOW SOON AFTER THE FILM HAS BEEN INSTALLED? Yes you can. You will need to be mindful to stay around two feet away when using the pressure washer, especially around the edges of the film. We advise waiting at least 48 hours after the installation before carrying out any washing. HOW DO I WASH THE FILM? The film can be washed in the same way you would normally clean your vehicle. PH neutral car shampoos are recommended. We also advise washing with a lambswool wash mitt using the two bucket method. CAN I WAX THE FILM? Yes, the film can be waxed and sealed just like your paintwork. However we do advise against waxing over the edges of the film. We suggest leaving a 2cm gap when waxing up to an edge of the film. CAN I HAVE CERAMIC COATING APPLIED AFTER I HAVE HAD MY PPF INSTALLED? There is no need to apply a ceramic coating to the finish once the PPF has been installed. As an XPEL Authorised Installer we will apply XPEL Fusion Plus coating to the PPF after the installation is completed. This has been specifically designed to protect your XPEL PPF from the elements whilst significantly increasing the hydrophobic effect. HOW DOES THE FILM HEAL ITSELF? Paint protection film uses a special polymer in its clear coat that flows even though it is cured. This allows the clear coat to find its natural level again after being disturbed on the surface. WILL A DEEP SCRATCH HEAL? The time for a scratch to heal depends on the severity of the scratch and the ambient temperature. Minor scratches usually heal within 30 minutes at room temperature. The healing process can be accelerated at any time by pouring hot water over the scratched area. WILL THE PAINT UNDERNEATH THE FILM FADE AT A DIFFERENT RATE? No. The film allows UV to pass through the film and fade the paint underneath at the same rate as the exposed paint. HOW DOES THE FILM RESIST STAINING? The clear coat on the film has a very low surface energy, which makes it extremely difficult for organic compounds to stick to it. Insects, bird droppings and environmental contaminants (which would normally cause yellowing) such as road oils, exhaust smoke, and pollution can be removed during regular washing. WHAT IS THE EXPECTED LIFE OF THE FILM? Our XPEL ULTIMATE and XPEL STEALTH films are warranted for 10 years. 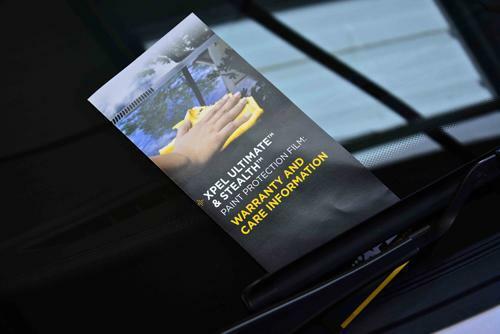 This warranty covers: yellowing, staining, delaminating, cracking, peeling, bubbling, and more. DO YOU REMOVE PAINT PROTECTION FILM? We highly recommend that any film should be removed by a professional installer such as ourselves. This guarantees safe removal using the correct methods. However, if this is not possible please contact us for a thorough explanation on how to carry out the procedure.